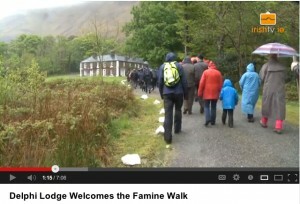 The annual Famine walk took place on May 18th last when Delphi Lodge for the first time ever opened its gates and welcomed the participants to commemorate the original journey undertaken in March 1849. The rain poured from the heavens which made the occasion all the more poignant and solemn, yet an atmosphere of unity and contentment pervaded. It was an emotional day for everyone at the Lodge and we’re delighted to have been a part of it.